From beginning to end, it should take no more than 30 minutes, less if you are somewhat at ease in the kitchen. It requires very little equipment other than either a mandolin or a potato ricer to prepare the potatoes. You could likely use a cheese grater, but I have yet to try that. Let me know if you do, it might actually be a good option. Medium size yellow potato—Either peeled or not, sliced very thin, using a mandolin (or a potato ricer). 3-4 oz. 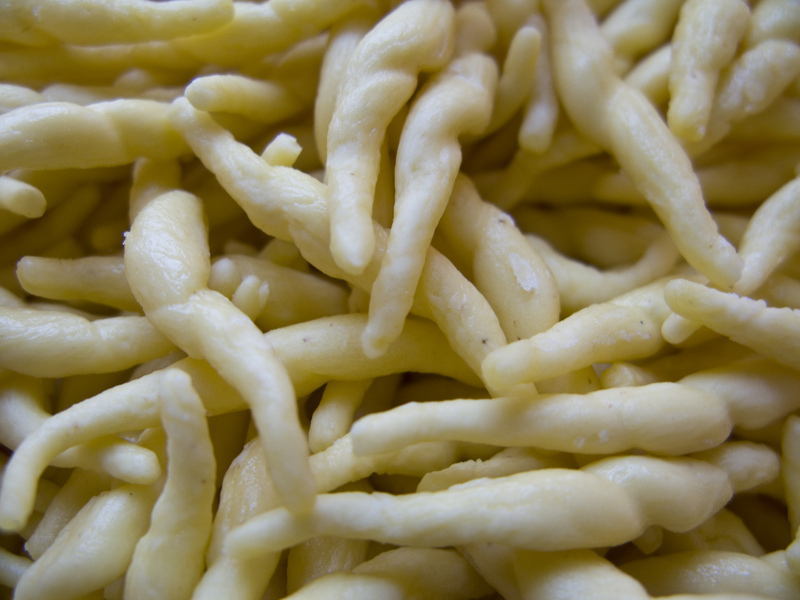 of sliced mushrooms per person–chanterelles would be the best, but they are somewhat hard to find and can be pricey, so I usually get cremini or shitake, but plain white will also do. Onion, shallot, garlic—just a handful, diced. I usually throw in a clove or two of garlic and then a shallot, but I have also used onion—just adding a little flavor here. A grated semi hard to hard cheese that will melt easily. I have used Tomme de Savoie, Gruyère, Comté and Asiago Fresco—it seemed that the Asiago Fresco (not the aged Asiago) worked the best. A splash of chicken or vegetable stock—you can also use some of the water from the cooking pasta. Olive Oil—a splash to get the onions going. As the water is boiling/pasta is cooking, heat up a skillet and then add a little olive oil, add the onion and garlic and sweat them a bit. Add the mushrooms and toss for a few minutes until it is clear the mushrooms have reduced a bit. Add a bit of the chicken stock (maybe a quarter cup) and then start adding the potato in the middle of the pan (with the mushrooms off to the sides), bit by bit, stirring rather vigorously, cooking the potato. If you had riced/sliced the potato finely enough, it will essentially disintegrate and thicken into almost a paste. If the potato is not fine enough, don’t worry, just cook a little longer, ensuring it is cooked through. Add the cheese and toss until melted. At the very last moment, add a handful of arugula, and fold it in, causing it to wilt slightly. 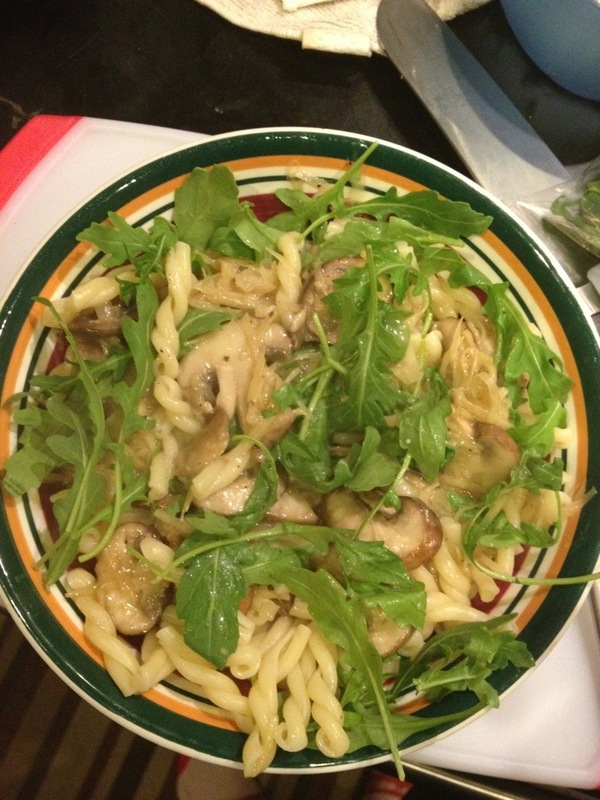 Portion out the pasta into bowls, mix in the mushroom ‘sauce’ and some additional arugula.